2016-01-26 NEW • Distribution Release: ROSA R7 "Desktop Fresh"
Rate this project ROSA R7 "Desktop Fresh", a desktop Linux distribution featuring a customised KDE 4.14.8 desktop, has been released: "The ROSA company gladly presents ROSA Desktop Fresh KDE R7 - a distribution from the ROSA Desktop Fresh family with the KDE 4 desktop environment. Technical changes in comparison to the previous release (R6): the default set of applications has been adjusted - new programs include Kup for backups and Kamoso to work with web cameras, while KWallet has been removed from default installation; default installation now contains even more media codecs, including h.265; LTS kernel 4.1.15 is used by default, but separate repositories are available with kernel 4.2.x (x86_64, i586) and 4.3.x (x86_64, i586); X.Org Server has been updated to version 1.17.4, X11 drivers and libraries have been updated as well; MESA has been updated to 11.0.6; PulseAudio has been updated to 7.1; Chromium has been updated to 47.0; Firefox has been updated to 43.0.4 and Thunderbird to 38.3; LibreOffice has been updated to 4.4.7." See the release notes for more information and a list of package updates. Download the live DVD image from here: ROSA.FRESH.KDE.R7.x86_64.iso (1,927MB, MD5, torrent, pkglist). • 2017-06-08: Distribution Release: ROSA R9 "LXQt"
Svetlana Savelyeva has announced the release of ROSA R11, a new stable version from the project that develops a set of desktop-oriented distributions (originally forked from Mandriva Linux). The new release is available in four variants featuring KDE 4, KDE Plasma, LXDE and Xfce desktops. Some of the improvements in this release include: updated Linux kernel 4.15; updated desktops - KDE Plasma 5.14.4.1, LXQt 0.14.0 and Xfce 4.13.2; added support for installing system on M.2 and NVME SSD storage devices; added file system support for FfFS flash drives to the ROSA installer; improved graphic subsystem when ROSA is used as a guest system in virtual machines based on KVM and Hyper-V; added firmware to installation images to support Epson scanners; the system now creates a universal initrd instead of a hardware-specific one by default; the new btrfs-progs 4.19.1 now includes support for zstd compression algorithm.... See the release announcement and release notes (both links in Russian) for further information. Download (pkglist): ROSA.FRESH.PLASMA5.R11.x86_64.iso (2,204MB, MD5, torrent), ROSA.FRESH.KDE4.R11.x86_64.iso (2,055MB, MD5, torrent), ROSA.FRESH.LXQT.R11.x86_64.iso (1,564MB, MD5, torrent), ROSA.FRESH.XFCE.R11.x86_64.iso (1,680MB, MD5, torrent). Separate ISO images with support for booting on computers using the UEFI firmware implementation are also available. 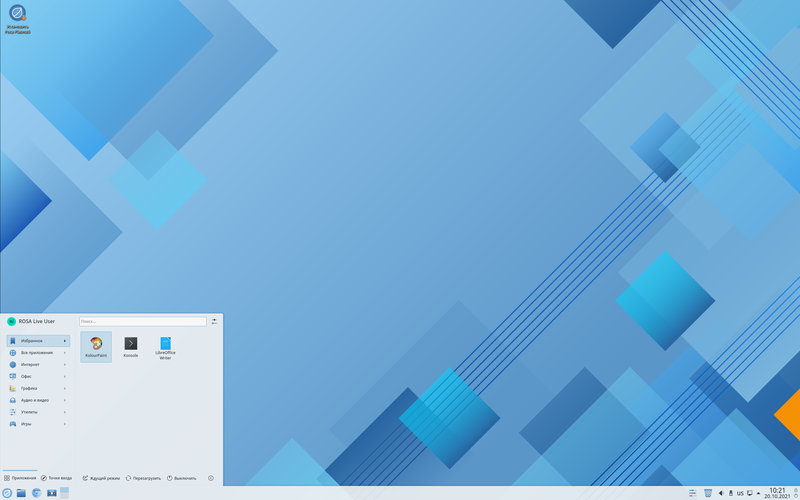 Vladimir Potapov has announced the release of ROSA R10, the latest stable build of the desktop-focused distribution with support for KDE 4 and Plasma 5 desktop environments: "ROSA Desktop R10 is the second release based on the ROSA 2016.1 platform. The distribution is targeted mainly at the Linux advocates eager to try new software versions. According to the updates policy, the ROSA 2016.1 platform will have four years of technical support. Technical changes in comparison with ROSA R9: many system libraries, system and software packages were updated to their latest versions; Linux kernel 4.9.60 LTS is used by default, other kernel versions and variants are available in special repositories; the proprietary NVIDIA drivers have been updated to new versions - 384.90 and experimental 387.12 for the relatively new video cards, 340.104 for GeForce 8 and 9, 304.137 for GeForce 6 and 7; MESA has been updated to version 17.1.6 with OpenGL support up to version 4.5...." See the release announcement (in Russian) and release notes (in English) for more details. Download (pkglist): ROSA.FRESH.KDE.R10.x86_64.iso (2,004MB, MD5, torrent), ROSA.FRESH.KDE.R10.x86_64.uefi.iso (2,022MB, MD5, torrent), ROSA.FRESH.PLASMA.R10.x86_64.iso (2,030MB, MD5, torrent), ROSA.FRESH.PLASMA.R10.x86_64.uefi.iso (2,043MB, MD5, torrent). 2017-06-08 Distribution Release: ROSA R9 "LXQt"
Vladimir Potapov has announced the release of ROSA R9 "LXQt" edition, a desktop-focused Linux distribution featuring the lightweight LXQt 0.11 desktop: "LXQt is the most lightweight and ascetic ROSA R9 edition. It is designed for machines which are not rich in resources (e.g. netbooks) and for users who like immediate reaction for any action. This ROSA will feel good even if you only have 512 MB of RAM. Specifics of LXQt in ROSA R9: all LXQt components are based on the freshest 0.11 branch with simplified ROSA theme, without compositing and desktop effects; we use NewMoon (PaleMoon) web browser - although compatible with Firefox ESR (which is used as a basis), it consumes significantly fewer resources; default installation includes some additional components for Internet users - Pidgin, qBitTorrent, Trojitá; the nomacs image viewer is installed by default, it also provides basic image manipulation facilities; Rosa Media Player and Audacious are included." See the release announcement (in Russian, includes screenshot) and release notes (in English) for more information. Download: ROSA.FRESH.LXQT.R9.x86_64.uefi.iso (1,409MB, MD5, torrent), ROSA.FRESH.LXQT.R9.x86_64.iso (1,396MB, MD5, torrent), ROSA.FRESH.LXQT.R9.i586.uefi.iso (1,413MB, MD5, torrent), ROSA.FRESH.LXQT.R9.i586.iso (1,404MB, MD5, torrent). Vladimir Potapov has announced the release of ROSA R9, a major update of the distribution which started as a fork of Mandriva Linux and which retains many of Mandriva's tools. The new version comes in two desktop variants - KDE 4 or Plasma Desktop 5.9: "ROSA R9 is the first release based on the new package platform 2016.1. The distribution is targeted mainly at Linux advocates eager to try new software. According to the updates policy, the R9 version of the ROSA distribution will have 4 years of technical support. Technical changes compared to ROSA R8: most of the system libraries, compilers and system/user software were updated to their new and latest versions (glibc, boost, GCC, Clang); a new additions to the repositories were made, e.g. LDC (the D language compiler), Meson (a powerful open-source build system); added a glibc patch, drastically boosting the load speed of the dynamic shared objects (DSO)...." Here is the brief release announcement, with additional technical details and changelog provided in the release notes. Download (pkglist): ROSA.FRESH.KDE.R9.x86_64.iso (2,064MB, MD5), ROSA.FRESH.KDE.R9.x86_64.uefi.iso (2,075MB, MD5), ROSA.FRESH.PLASMA.R9.x86_64.iso (2,085MB, MD5), ROSA.FRESH.PLASMA.R9.x86_64.uefi.iso (2,098MB, MD5). Vladimir Potapov has announced the release of an updated build of the ROSA distribution, version R8.1. This is a bug-fix update for the KDE edition only, while the remaining flavours (GNOME, MATE and Plasma) are staying at version R8 (at least for now): "We are happy to present the correcting release of ROSA Fresh R8 platform by launching updated ROSA Fresh R8.1. This ROSA Fresh R8.1 release is primarily made for users who need stable LTS platform on modern hardware. This release contains all patches and software updates for Intel Skylake chipset and similar modern chipsets, also kernel 4.9.x is available right out of the box. ROSA Fresh R8.1 includes a lot of bug fixes, primarily for fixing network issues and some installation problems. Most important features and bug fixes: several fixes for installation and booting problems in live mode on some systems; Linux kernel 4.9.x LTS; Mesa 13.0.2 with support for OpenGL 4.5 to run modern games with free drivers...." Read the rest of the release announcement for further information. Download: ROSA.FRESH.KDE.R8.1.x86_64.uefi.iso (2,000MB, MD5, pkglist). ROSA R8 has been released. ROSA is a Russian Linux company, previously cooperating with Mandriva and now building various Linux solutions for individual users and enterprises alike. Unlike the previous versions of ROSA, this one is delivered in four separate variants featuring, the GNOME 3.16, KDE 4.14, KDE Plasma 5.7 and MATE 1.12 desktop environments: "ROSA Desktop Fresh R8 is a distribution for enthusiasts in a constantly changing Linux world. It's the last release based on the ROSA 2014.1 platform. R8 is a stable release with two years of extended support (security updates will be provided until the third quarter of 2018). ROSA Desktop Fresh R8 features four desktop environments: KDE 4 - stable, recommended for home users; GNOME 3 - simple and easy to use; Plasma 5 - a new version of KDE, recommended only for Linux enthusiasts because it's not as stable as KDE 4; MATE - fast and lightweight for older hardware." The release announcement is provided in Russian only, but the project's English language Wiki pages have n brief overview as well as detailed release notes with a changelog. Download (pkglist): ROSA.FRESH.KDE.R8.x86_64.iso (1,945MB, MD5, torrent), ROSA.FRESH.GNOME.R8.x86_64.iso (1,488MB, MD5, torrent), ROSA.FRESH.PLASMA.R8.x86_64.iso (1,948MB, MD5, torrent), ROSA.FRESH.MATE.R8.x86_64.iso (1,443MB, MD5, torrent). 2016-02-27 Distribution Release: ROSA R7 "Desktop Fresh GNOME"
Konstantin Kalmykov has announced the release of ROSA R7 "Desktop Fresh GNOME" edition, a desktop Linux distribution featuring a customised GNOME 3.16 desktop: "The ROSA company gladly presents ROSA Desktop Fresh GNOME R7 - a distribution from the ROSA Desktop Fresh family with the GNOME 3 desktop environment. As always, the distribution presents a vast collection of games, emulators and the Steam platform package, along with standard suites of audio and video communications software, including the newest version of Skype. All modern video formats are supported. The distribution includes the fresh LibreOffice version. This distribution contains GNOME 3.16 with new user-friendly notifications and a system tray. In this distribution we have replaced the old ROSA Elementary theme with a new Korora for GNOME Shell and EvoPop for GTK+. We have also replaced the icons. In LibreOffice we start using new grey icons." Read the release announcement (in Russian) and the release notes (in English) for more details and screenshots. Download: ROSA.FRESH.GNOME.R7.x86_64.iso (1,467MB, MD5, torrent), ROSA.FRESH.GNOME.R7.x86_64.uefi.iso (1,480MB, MD5, torrent). 2015-12-12 Distribution Release: ROSA R6 "Desktop Fresh LXQt"
Sergey Aleksandrov has announced the release of ROSA R6 "Desktop Fresh LXQt" edition, a lightweight edition of ROSA that features the LXQt desktop for the very first time: "After several months of ROSA Desktop Fresh R6 KDE release, we are happy to announce a lightweight edition of Desktop Fresh R6 which uses LXQt desktop environment. Up to Desktop Fresh R5, we used to release lightweight editions on the basis of LXDE. However, LXDE is based on GTK+ 2 library stack which didn't get significant updates since the year 2011 - all new features are now implemented in the GTK+ 3 series. The old GTK+ 2-based LXDE is not dead and is still developed by a group of volunteers, but their progress is not as significant as LXQt's one. In particular, there was almost no significant difference in LXDE components between LXDE editions of ROSA Desktop Fresh R4 and Fresh R5. But our distribution has a 'Fresh' word in its name, so we decided to give a chance to a new desktop environment. And after several months of experiments, integration work and bug fixes, we are ready to present a new edition of ROSA Desktop Fresh which is based on LXQt." Continue to the release notes for further information. Download: ROSA.FRESH.LXQT.R6.x86_64.iso (1,276MB, MD5, torrent).